A couple of weeks ago on #fabricchat (a Twitter chat that takes place most Fridays at 4pm ET, hosted by @lbreton of Three Dresses Project) we discussed seam finishes. Indeed, we all want the insides of our garments to be neat. Although a serged edge was rather popular among the fabricchatters, and has been my default seam finish, I admit that sometimes I'm not thrilled with the serged edges on my sweater knits. After a wet block or a washing they can sometimes look a little frayed -- ok for a pullover, but not so good when they show on the inside of a jacket. A bound seam with both edges bound together is neat and lasts longer. It's also nice because it can be made reliably without a serger. Adding top stitching will keep the seam flat, but the whole process requires three passes on the sewing machine -- two for the binding and one for the top stitching. And so I've been experimenting with a "binding" simply to hide the edge and not encase it, combined with top stitching to hold the seam flat. The raw edges do not show. 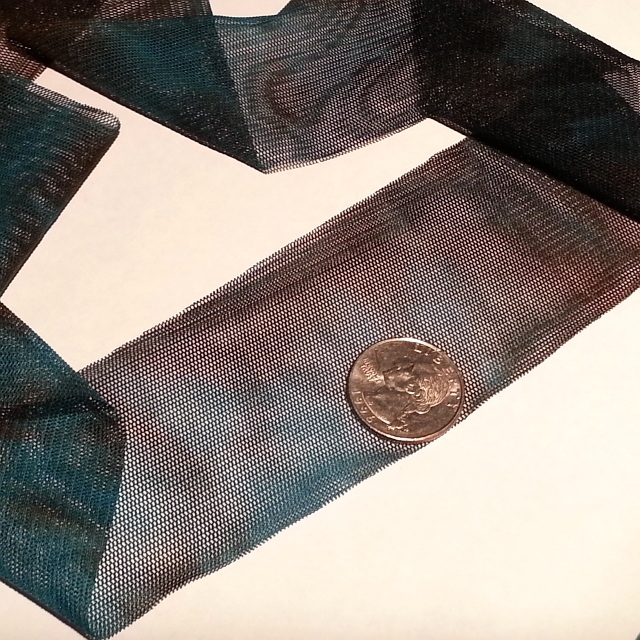 The finish is done with two passes of narrow zigzag, which keeps the seam stretchy and makes it stable. I'm still experimenting. Public side on top, inside on the bottom -- with a little practice it has potential. In this example I used a very thin, space-dyed tricot for the mock binding. The sweater knit fabric I'm practicing on is double knit merino wool available in the shop. This edge finish is still quite new for me and may require some fine tuning. Step 1. 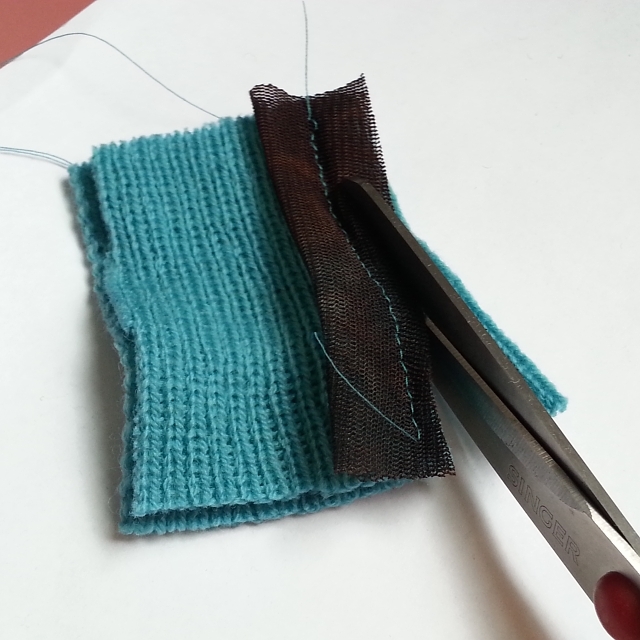 Cut a 2-inch strip of tricot (or other lightweight knit) for the edge covering, perpendicular to the tricot selvage. Step 2. Fold the strip in half lengthwise and place layers in order. If it's important for the seam to lay toward the back piece, let's say, then the seam must be sewn with the back piece on the bottom. From the bottom the layers would be back piece, then front piece. (Back and front are placed with right sides together.) On top is the folded tricot strip. All raw edges are lined up like in the pic below. Step 3. Sew the seam with half inch seam allowance using a narrow zigzag, sometimes called a wobble stitch. 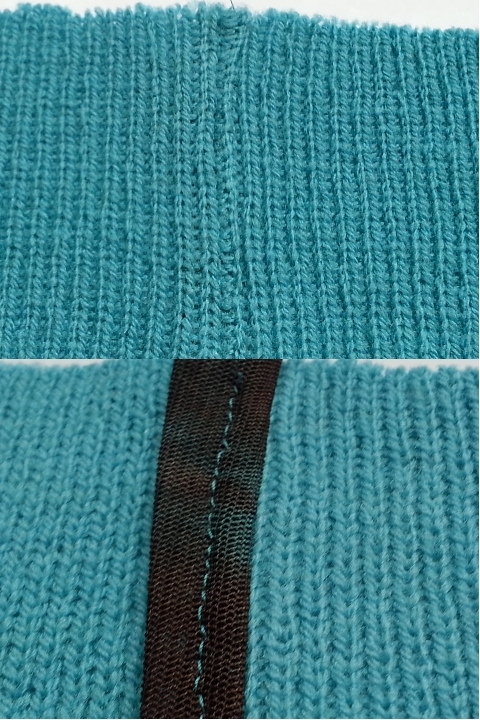 My stitch width of 0.5 mm and length of 3 mm kept the seam nice and stretchy. Step 4. Trim the seam allowance. Step 5. Steam (Don't touch iron to fabric.) the seam as sewn. Then steam the binding toward the seam allowance. Then open the fabric and steam the seam allowance to one side, the "back piece" in this example. Step 6. From the right side, top stitch with narrow zigzag through the layers of fabric seam allowance and tricot. The result is a nice, flat seam on the public side and a neat finish on the inside. The two passes of narrow zigzag keep edges from fraying. The narrow zigzag top stitching is barely visible and doesn't appear wobbly with a sweater knit. A walking foot is highly recommended. 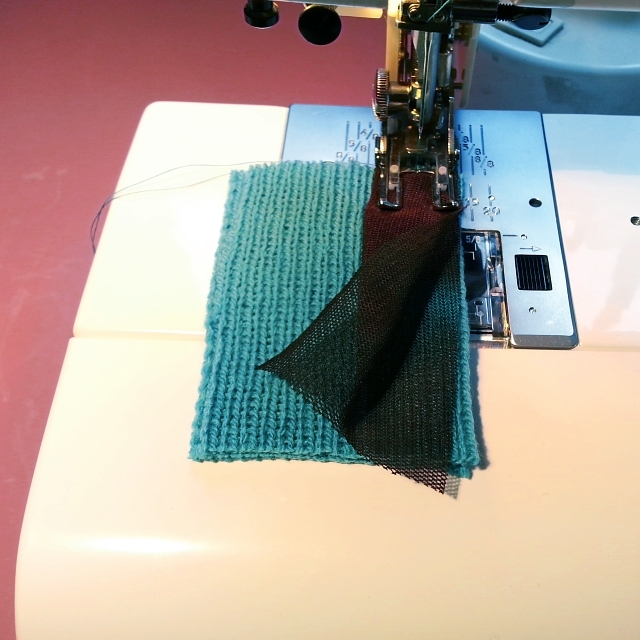 Also be sure to lessen the pressure on your presser foot with sewing sweater knits, if it's possible with your machine. I'll use this seam finish for my next garment. It'll be impossible for me to top stitch the sleeve seam, so I'll probably do a double fold binding there. If anyone gives this finish a try, please let me know how it turned out.